The BORK (Bolt On Ripping Knive) is sold by Bob Ross and is available from The BORK Store The asking price is $115. I learned about the BORK from, where else, here at LumberJocks from a review by KnotScott. Since knotscott already has a full review, I’ll just give my impressions and experiences. Tools used: 5/16” socket w/ 1/4” drive ratchet, straight screw driver, any friendly persuader of your choosing, a good flash light and I used a 18” steel rule. What you get: Riving Knife, mounting bracket, hose clamp and an allen wrench for alignment. Installation. The BORK is mounted to the arbor with a simple hose clamp. Simple, yet very affective. I had problems with my bracket sliding from side-to-side. I quick email to Bob let me know that the problem was with me. I just needed to get after the hose clamp and put some torque on it. The hose clamps that I get locally won’t take much torque so I was a little “timid” on the tightening. Tip #1: When installing the hose clamp, be absolutely certain that you don’t have it wrapped around the arbor AND the trunnion! Oops. Setup. If you’re not the sort of individual that likes fiddling with things, then stop now because the setup is tedious. Tedious may be a little strong just because of working inside the saw is hard, unless you have small hands, I don’t. There are 7 small screws that need to be adjusted to get the knife in the same plane as the blade. Bob includes the allen wrench for the adjustments screws. Because the adjustments have to be accomplished with the blade on, it makes it that much more difficult and your working around a sharp blade, expect a cut or two. I spent about an hour getting the knife set properly. With the blade on, install the knife, check the alignment, remove the knife and adjust the alignment screws. Wash, rinse and repeat until your dead on. I used a screw driver w/ a little persuasion to bump the bracket towards the back of the saw a little to get enough clearance between the knife and the blade. Tip #2: Here’s a tip that may help you with the alignment process, it did me after I figured it out. Get the knife so that it’s perfectly vertical first, disregarding any skewing and any side-to-side misalignment. Once you have the knife vertical, getting it into the same plane as the blade becomes quite easy as there are two screws on the top of the bracket that are readily accessible that make this very easy and can be done with the knife on. Tip #3: You may wont / need to run the adjustment screws out about 1/4 of the way to start with. This will give you a little more adjustment for the side-to-side and skew adjustments in Tip #2. Tip #4: This probably goes w/out saying but check for interferences. Make sure the hose clamp is not interfering w/ the arbor, the bracket isn’t too far back and interfering with the rear trunnion, or the knife is rubbing on the blade. I recommend that you send Bob and email to make sure that the knife will fit on your saw and get a price ;). Bob is a great guy and seems to love communicating to ensure proper success. I now have a riving knife on my saw! The knife blade is simple to remove when not needed. Bob is quick to answer any and all questions. You need nothing else, other than tools, to install the BORK. Installing the BORK on the saw is difficult due to the tight space , no fault of the BORK. The hose clamp and bracket interfere with the the arbor wrench making blade changing more difficult. 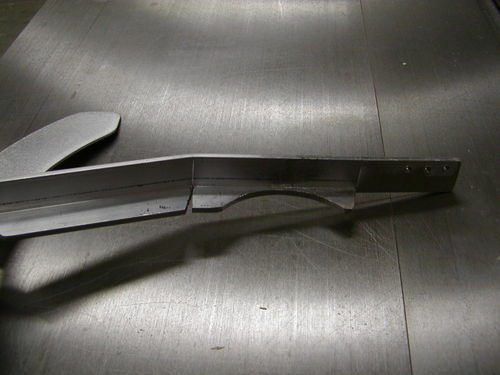 The bracket hits the bottom of the table when the blade is raised to it full height. I lost about 3/16” max blade height. Big whoop. How often do I cut something that thick on my saw anyway? Setup / alignment is difficult due to the tight space. I have been looking for a riving knife solution for my saw since the day I purchased it. My saw came with a splitter that was more often in the way and a PITA to remove and install. The short of it is, I’ll buy another BORK when needed. Sorry, that ended up being a lot longer than I had intended. Great review, well writen, thanks for sharing. It’s a bargain at twice the price if you ask me. Oh and you did. lol If it keeps a board from getting pinched between the blade and coming back into my face, it’s well worth the money and time invested. The Biesemeyer T-Square Anti-Kickback Snap-In Spreader at Amazon runs from $143 – $160 and that’s for a splitter not a riving knife. My saw came with a splitter and I never liked it. I tried to use it but it was always in the way and it didn’t tilt with the blade, which ultimately lead to it’s untimely death. I’m hoping that I will use the riving knife as it is very easy to install and remove, no tools required like my original OEM splitter. This is a picture of the aluminum bracket that clamps to the arbor. Unfortunately the dummy with the camera didn’t include the back side of the bracket where the knife attaches. I’m late to the dance on this, but I’m glad to see that you pursued it. Excellent review.